The structure of your relocation policy, in combination with your administration arrangements and the volume of transfers, can significantly impact the cost of employee mobility. Relocation costs are outweighed, hopefully, by the benefits of having the employee in the new position and meeting the business needs. From an employee’s perspective, career development or advancement associated with the new position and new challenges are seen as positive. However, employees and their families also feel the cost of relocation through disruption to their daily lives, leaving family and friends behind, changing schools, changing environment, losing spousal employment, and the list goes on. How do you balance the need to assist employees and their families with containing the cost of relocation? 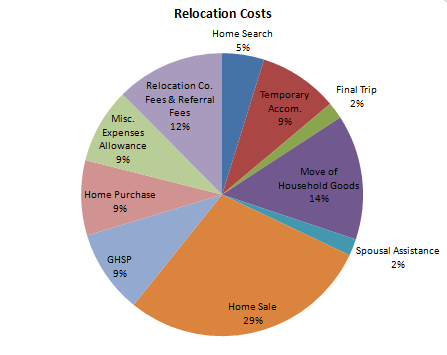 What is the return on the investment in relocation? Where should you place the emphasis in your mobility program? This chart illustrates some of the costs associated with employee mobility. There are others also, such as housing, rental or cost-of-living subsidies, and several costs associated with international assignments. Budget constraints may be pushing you to contain or reduce some of these costs. You may be feeling pressure to maintain or increase employee satisfaction with the program or increase the level of acceptance of assignments. These issues often stem from a policy that is ”unbalanced” or less competitive than it should be. Many of the low cost/high irritant items are “Low Hanging Fruit”, enabling you to improve your policy’s employee satisfaction rate with minimal impact on cost. For example, in an attempt to reduce costs, some corporations reduce the number of home search trips or number of days on the home search trip. This is a relatively low cost but high irritant item and should not be targeted for cost reduction. Likewise reducing the spousal assistance allowance has a negative impact without appreciably containing costs of the program. A focus of policy design has been to provide flexibility by allowing employees to “trade off” unneeded provisions for services unique to their family’s needs at no additional cost to the corporation. In future blogs, we will address many employee mobility topics, including the various drivers of cost, a Return on Investment (ROI) approach to domestic and international relocation, and the useful information derived from policy and service quality surveys. We will also present ways to mitigate the financial risk of certain employee mobility policy provisions, concentrating on the high cost items first, address issues that are considered irritants for employees, and demystify pricing of relocation services. Stay tuned!